Prepare the turkey sliders by combing in large bowl ¼ cup of the Wheat Beer, ground turkey, red pepper, breadcrumbs, cilantro, basil, scallions, orange zest and salt. Stir to mix well. Shape mixture by ¼ cupfuls into twelve three-inch round sliders, about ¾ to 1 inch thick. Set aside. In a medium saucepan, whisk together remaining beer, orange juice, honey mustard, brown sugar, onion, vinegar, tomato paste and butter. Stir to blend well. Add reserved squeezed orange shells to the saucepan and bring mixture to a boil over high heat. Reduce heat to medium; boil 15 minutes, stirring frequently, or until sauce is thickened and mixture is reduced to 1 cup. Discard orange shells. Cool sauce to room temperature. Reserve ½ cup of sauce for serving with sliders. Spray broiler pan or grilling rack with olive oil cooking spray. Prepare gas or charcoal grill or preheat broiler. 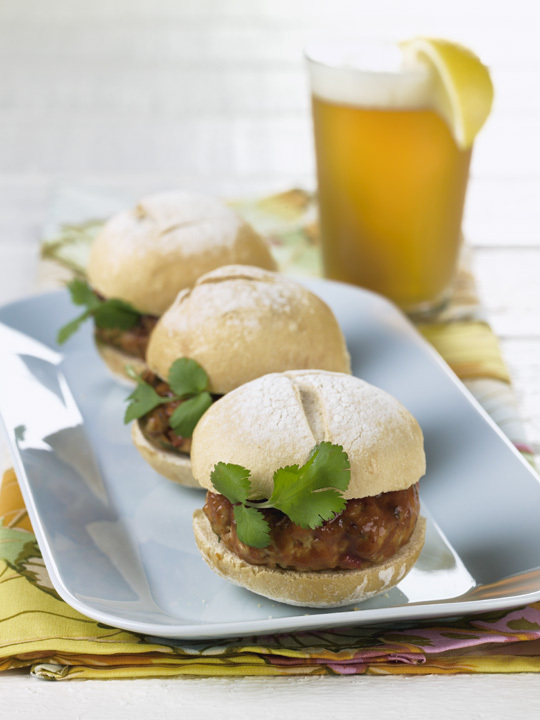 Place sliders on grill or under broiler and cook 8 minutes, turning and brushing sliders with orange beer BBQ sauce, until fully cooked through. Serve on split soft dinner rolls with reserved sauce.